Banking and real estate stocks are considered the leading stocks as they account for 40% of the total market capitalization and 47% of the average daily trading value in the year to date. Building investment strategies for the coming time as well as in the coming years will depend heavily on how these two sectors will perform. 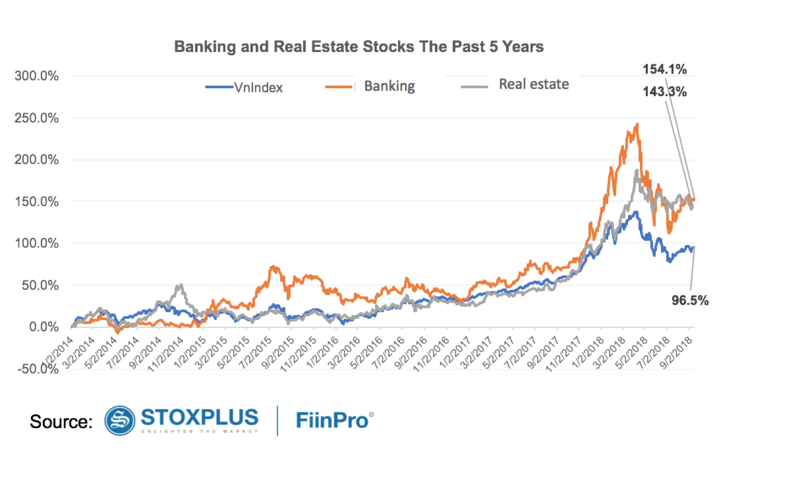 Over the past five years from 2014 to 2018, banking and real estate stocks have outperformed the overall market. 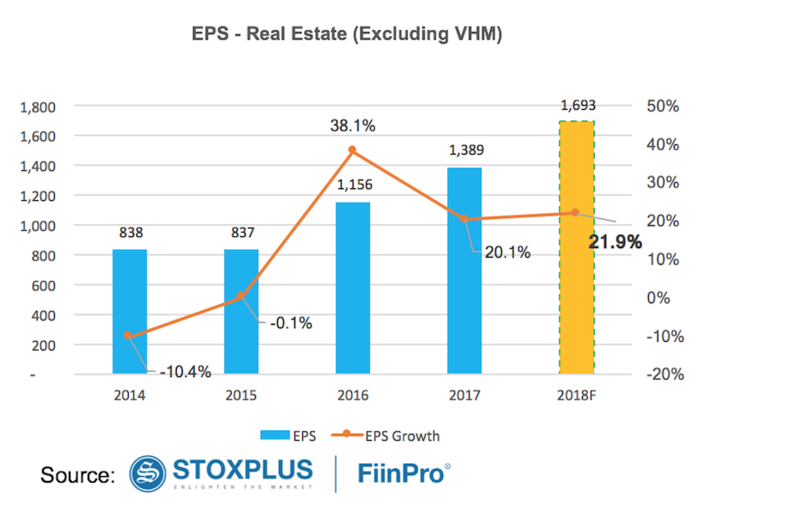 FiinPro data showed that these two sectors have achieved three-digit growth over the past five years, while the VNIndex has been double-digit, the banking sector has increased 154.1%; real estate stocks rose 143.3% and VNIndex gained 96.5%. Over the same period, the EPS of both the banking and real estate sectors fell slightly in 2015 but posted a sustainable growth in 2015, 2016 and 2017 and is forecasted to continue to grow well in 2018. First, looking back over the past 3 years, the banking sector has three main stories that drove bank share growth: (i) the story of consumer lending and, in particular, VPB and HDB; ii) booking revenue from insurance sales typically TCB, MBB and Sacombank; and (iii) most recently the story of strong growth in retail banking / personal loans. What will be the story for the end of 2018 and 2019 to come? 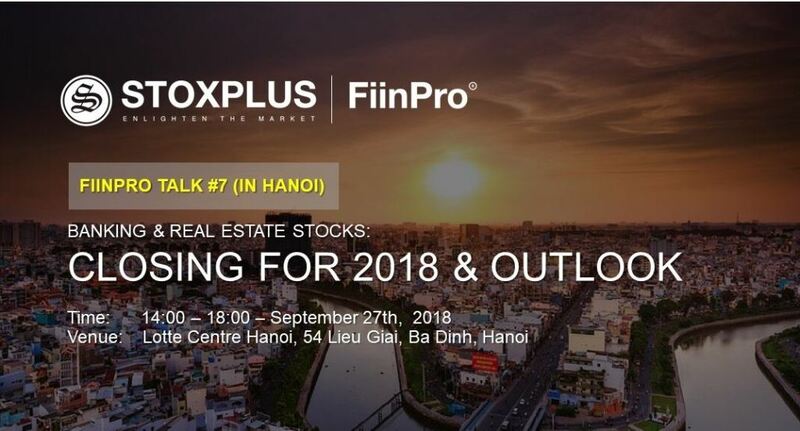 The FiinPro Talk 7 with the topic" Vietnam Banking and Real Estate Stocks: Closing for 2018 and Outlook" held on September 27, 2018 received a number of different opinions but all shared that the growth of personal credit and retail banking will continue to be the driving force behind the sector's profit growth. Of course, the quality of profits will depend on the product portfolio that the bank has strengths and focuses on. For example, VIB is strong in auto loans, while most other banks are quite diversified. Home loans are also a major component. The banking sector is forecasted to continue to grow well despite the fact that banks are unlikely to reach a 17% credit growth cap. 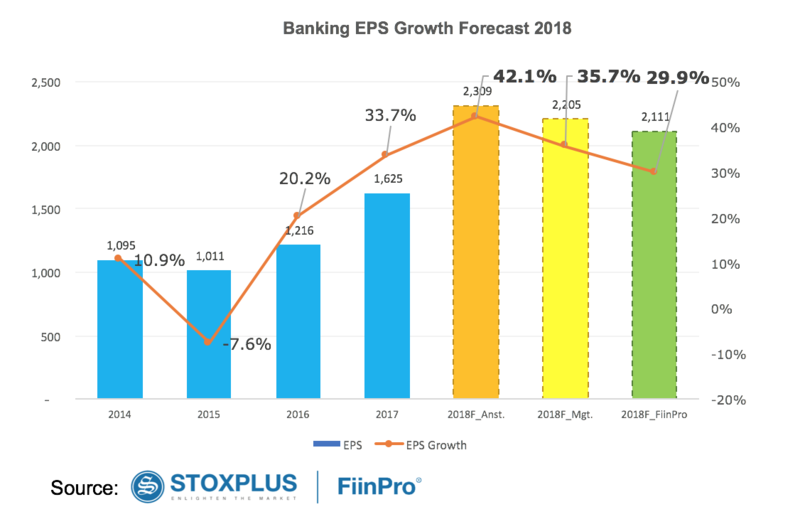 FiinPro data shows that analysts have the most optimistic view, forcasting the banking sector's EPS forecast to increase 42.1% by the end of 2018, while bank executives are more cautious with a forecast of 35.7% and StoxPlus’ forecast is 29.9% increase. 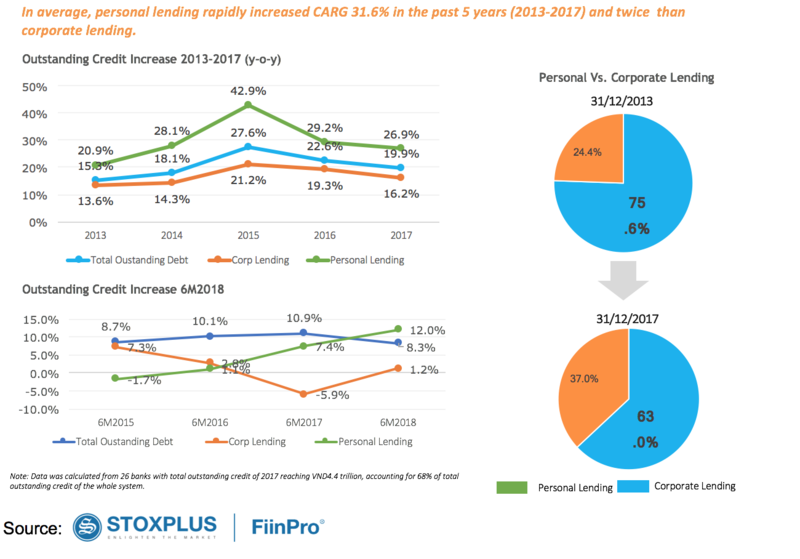 StoxPlus's forecast is based on assumption that credit growth in the last two quarters is equal to that of the same period last year and that credit growth in 2018 does not exceed 14%. The deposit growth rate in the last two quarters is equal to that of the same period last year. Average loan interest rates and average deposit rates are equal to the average of the last four quarters, provisioning / total outstanding is four times the most recent quarter (Q2/2018) and cost-to-income ratios 2018 will be equal to the same period last year. In fact, corporate lending has hardly grown. Credit mainly grow from personal loans. Only consumer credit has slowed down with CARG from 43% in the past five years to 6.67% in 1H2018. 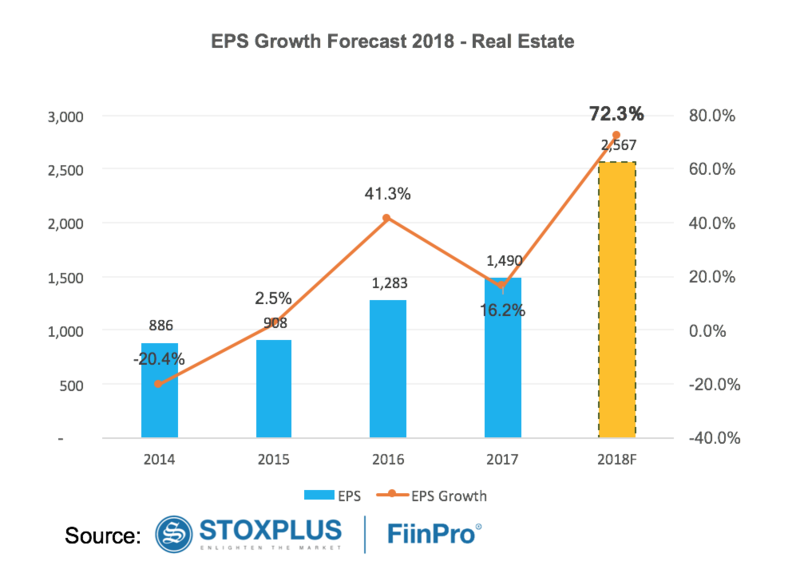 In the real estate sector, EPS will continue to rise sharply at 72.3% in 2018. Excluding Vinhomes, it still increased 21.9%. The workshop also pointed out that for real estate companies, the key factors are that the business environment and policies, if they create favorable conditions for real estate developers to mobilize capital from banks and customers or not; and more importantly, it is the Liquidity, that means real estate products can be sold or not. In fact, the real estate company will be profitable because of the difference "land" prices. The real estate industry's profitability can change or even reverse very quickly because of these factors. Therefore, investors need to monitor and evaluate each company based on their capacity as well as the list and progress of each major project. The real estate and banking sector's EPS growth has been the basis for the breakout of share prices of these two sectors and the VN Index in general, but many agree that earnings per share of these two sectors is approaching the peak which is somewhere seen in end 2018 or 2019. According to Savills, the real estate sector has not shown any sign of crisis, but the data showed that 65% of buyers in Grade A are investors. How sensitivity of the home buyer's available disposable income to interest rate increase is the question to watch. FiinPro Talk is a series of workshops organized by StoxPlus to create a sharing channel on highlight topics, which should give attendees in-depth information of market, to forming new investment idea or protecting recent assets. There is also an opportunity for networking with financial experts. For more information, please check it out at FiinPro Talk #6 at link http://fiinpro.com/FiinProTalk6 and follow our upcoming FiinPro Talk organized by StoxPlus at http://fiinpro.com/Events.